Rubrics are standard guides for evaluating and grading student assignments and other coursework. Rubrics contain evaluative criteria and scoring levels the instructor uses to rate the student's performance in those criteria. The student's scores, in turn, are used to determine her grade for the assignment. When the student views her assignment grade and feedback, she'll also see how she performed on each criterion. Rubrics can exist at the "global" level—when created in Academics > Settings, they can be used in any course. They can also be created at the individual course level for use only in that course. A rubric can incorporate criteria created for other rubrics. To be used—whether for grading or for sharing criteria with other rubrics—a rubric must be Published. Academic Admins can create new global rubrics in Academics > Settings > Rubrics. 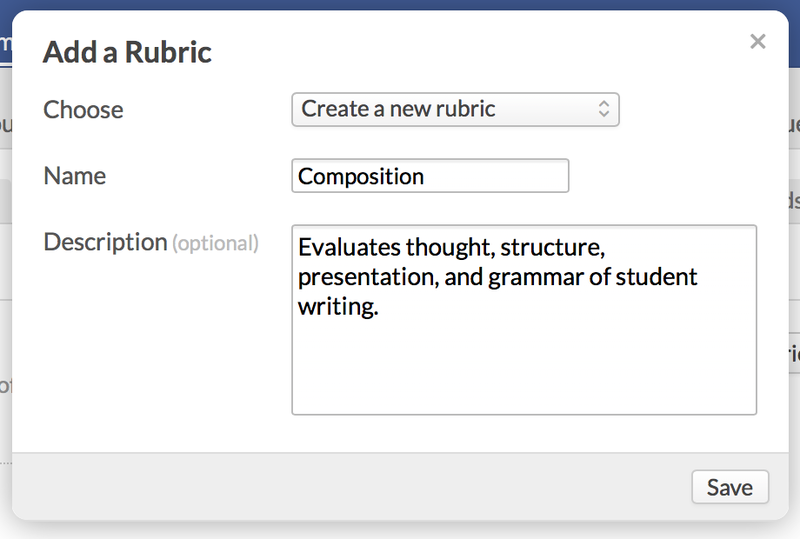 Faculty can create rubrics for their own courses in the course Rubrics view. Choose whether you wish to create a new rubric or duplicate an existing one. If duplicating an existing rubric, choose the rubric you'd like to copy and then click Save. Give the new rubric a name. Whether you add a new rubric or duplicate an existing one, after you save you'll be taken to the rubric's page, where you can start adding (or editing) its criteria. A criterion gives you a framework for scoring a particular aspect of the student's work. A criterion contains multiple levels that explain the student's performance on that aspect of the assignment—e.g. Good. Fair, or Poor. When a student achieves a certain level, he earns a certain percentage of the assignment's grade points for that criterion. You assign each level a certain percentage or range. Each criterion in a rubric carries part of the weight of the assignment grade. Go to the rubric's page. Enter a weight. This is the percentage of the overall assignment grade that the criterion will carry. You can later change this as you add other criteria to the rubric. Give it a name (required) and a description (optional). Check if you'd like to use ranges for your levels. If you don't, each level will be worth a set percentage, with the highest being 100%, the lowest 0%, and the remainder divided as you see fit. If you use ranges, you can customize the percentages the student earns for achieving that level. For each level, enter a name (e.g. Good, Excellent, Robust, Hilarious, whatever...) and a description (which is optional). Add another level by clicking . Delete a level by clicking . Before a rubric can be used in a course, it must be published! On the rubric's page, click Published. Once you publish a global rubric, it will be available for faculty to import into any course. Once a course rubric is published, it can be added to any assignment in that course. Here are the ways you can change a rubric and modify its criteria. 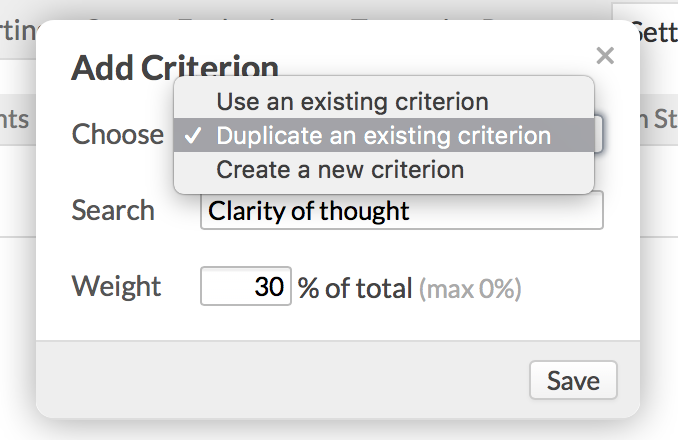 Criteria weights: When editing a criterion (see below), you can change its weight. 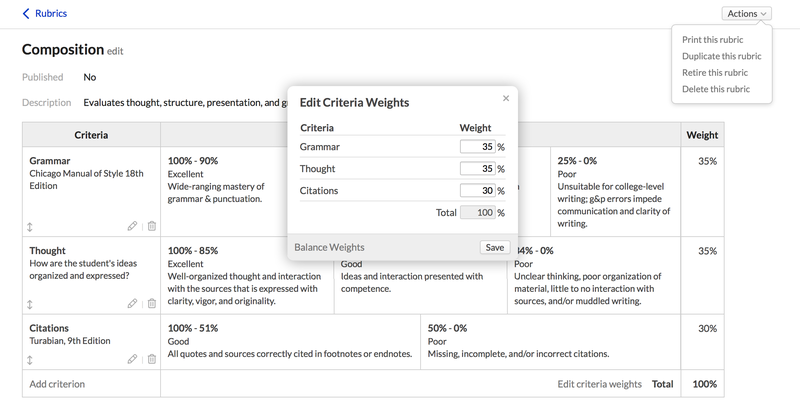 You can also click Edit criteria weights at the bottom of the rubric and adjust all the weights at the same time. The weights of a published rubric must add up to exactly 100%. When you edit all criteria weights at the same time, click Balance Weights to give each criterion the same weight as the others. Re-order the criteria in the rubric by clicking and dragging the elements. Remove a criterion from the rubric by clicking . Doing so does not delete the criterion altogether. Click to edit a criterion. You cannot edit a criterion if it is used in another rubric or has been used to grade student work. If you cannot edit the criterion, you'll be given the option to replace it with a copy and edit that instead. 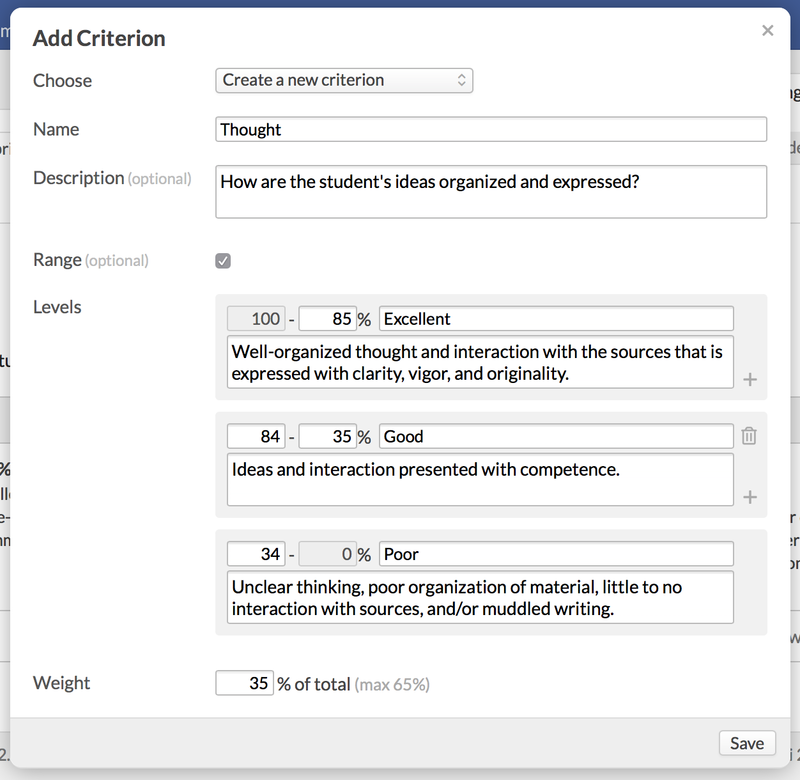 Academic Admins can also work directly with criteria in Academics > Settings > Rubrics. Click Add Criterion to create a new criterion. Now read about how faculty can use rubrics in their courses. This is life-changing. Such a valuable new feature. Thank you guys!